Acid phosphatases (EC 3.1.3.2.) are a group of enzymes which hydrolyze various esters of orthophosphoric acid at pH optimum of 4.8 to 6.0. The enzyme was first identified in human erythrocytes by Martland and co-worker in 1924. However, it was the pioneering reports of Gutman and his co-workers that opened a new era of serum acid phosphatase in clinical medicine. Since the first demonstration of elevation of serum acid phosphatase in advanced prostatic cancer by Gutman and his associates, measurement of this enzyme has been employed as a biochemical aid to diagnosis of prostatic cancer. 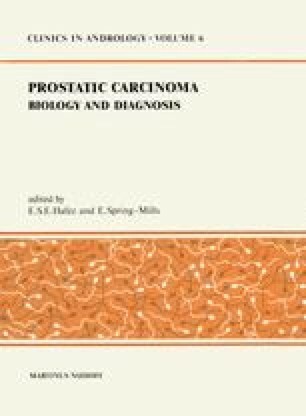 Furthermore, since Huggins and Hodges in 1941 demonstrated the effect of steroid hormones on prostatic cancer and its correlation to serum phosphatase levels, serum acid phosphatase assay has been adopted as an indicator in surgical and hormonal therapy of prostatic cancer (Batsakis et al. 1970, Bodanski 1972, Sodeman and Batsakis 1977, Townsend 1977, Yam 1974).